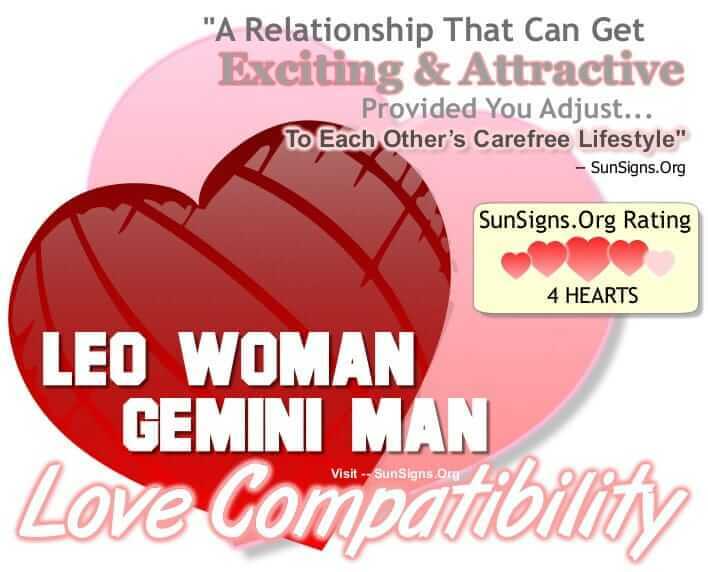 Are Leo woman Gemini man compatible mentally, emotionally and sexually? The word that best describes the pairing of a Leo woman and Gemini man is energetic. She is bold and adventurous while he’s creative and lively, making the lioness and male twin an exciting combination. But his fickle nature may get in the way of her need to lead. What is the best match for a Leo woman? Find out now! The attraction between the fire sign Leo and the air sign Gemini comes from their dazzling conversations. The Gemini man is extremely bright and loves mental stimulation, and she gives him a run for his money. He notices her at a social gathering or even just in a public place, where she commands the attention of everyone around her. He is drawn to her social grace and charm, and the Leo woman responds to his flirtatious banter. The Gemini male in love is playful and affectionate, which matches her original style of getting to know someone. And she helps to organize his scattered thoughts in a manner that is helpful to her partner. This will only cause a problem if her Gemini lover feels she is trying to control him, for he is controlled by no one. And their time between the sheets will never be boring. The Leo female sexually is passionate and exciting, while he is inventive and daring. He will come up with new ways to please his lover, and she will indulge in his every fantasy. Her lust and primal urges will keep him coming back for more, while he continuously challenges her. The Leo woman Gemini man sexual union will be fun and satisfying one, as long as he can convince his lady love that she is the only one for him. As queen of her castle, she demands pure devotion, and his wandering eye will bring out her jealous nature. Now, this isn’t to say he will cheat on her – he can be faithful if with the right woman. It simply means the Gemini man sexually is constantly looking for new adventures. As long as she can come along for the ride, then this will never be an issue. But before they cement their love relationship in and out of the bedroom, she must know she has his complete loyalty. The Leo woman and Gemini man can find balance if he proves that she can trust him. He showers her with the constant love and attention as she needs to feel appreciated and adored. If she lets him, he can lead her to places she would never have gone before they met. And she will add purpose to his lofty goals, helping him to achieve things he would never have without her. Dating a Leo woman or dating a Gemini man comes with its share of fun! The Gemini man’s wandering nature may become an issue in other areas of their life together. While the Leo woman loves the “up for anything” attitude of her Gemini mate, she does not approve of his carefree lifestyle. She wants more order in her kingdom, and he is too unstable to offer that in this Gemini compatibility. Gemini men need their freedom to wander whenever the mood strikes and Leo women in love will have trouble relinquishing that kind of control over the relationship. But if he can reassure her that he will return again and again, she will allow them to take the next step together. This will lead to arguments between the two sun signs where his sharp tongue will bring out her sharper claws. She will try to tame this wild man, and he won’t have it in this Leo compatibility. Leo is a fixed fire sign whereas Gemini is a mutable air sign, the Leo woman Gemini man compatibility gets a FOUR Hearts rating. As long as the Leo woman Gemini man pair can learn from each other, they will go far as a couple as the love compatibility between the two of them is excellent. This is a great zodiac love match. Next What Is Moon Magic?